Hughlett Temple A.M.E. Zion Church began its rich heritage one hundred forty-two years ago in a building on Center Street, now Armory Place, in Louisville, Kentucky. 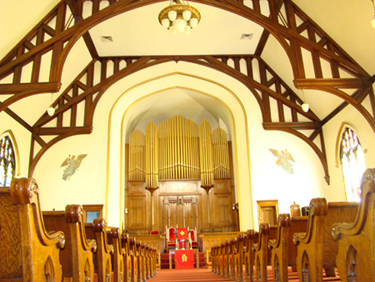 It was initially established through and partially sustained by the Methodist Episcopal Church. Members of the new Chestnut Street C.M.E. Church and our congregation were at one time one, until the idea of wanting Bishops and administrators from within the race struck a portion of the leadership. It was decided to petition the AM.E. Zion Church to accept us into their connection. Arrangements and notices were sent throughout the state of Kentucky to likeminded people, and from this idea, the Kentucky Annual Conference of the A.M. E. Zion Church was born on July 6, 1866, in the Center Street Church, under the leadership of Bishop Samson Talbott. According to the doctrine of the A.M.E. Zion Church, pastors are appointed to lead congregations. The first pastor of the new church was Rev. W.F. Butler. Under his leadership, the congregation purchased ground in 1867 on 15th Street near Cedar to build a new edifice. On completion, the church became known as 15th Street Memorial A.M.E. Zion Church. In 1870, a zealous young leader, the Rev. Jehu Holiday, was appointed to the church, later becoming one of our first Bishops. About this time, a portion of the membership moved to another site, forming what is now Broadway Temple A.M.E. Zion Church. Those members remaining, though a small group, continued to support and uplift the name of Zion, led by such illustrious pastors as the Reverends J.W. Smith, Alexander Walters, C.C. Marks W.O. Carson, and D.l. Irvin. In August, 1922, the Church moved to 2324 West Chestnut Street under the leadership of Rev. H.C. Weeden. The next appointed pastor was Rev. W.B. Carr. During this time, the church became one of the great gathering places for our people. Weekday school was conducted there, allowing ambitious youngsters to achieve a greater educational foundation for the future. In 1930, Rev. Daniel J. Hughlett was appointed to lead this already-great congregation. Under his 30-year leadership, the Church became a beacon of the community. Youth programs were always at the forefront of Rev. Hughlett's ministry, as well as serving both the spiritual, physical, and economic needs of the community. Always a place for unusually great sermons and life-giving singing, Rev. Hughlett instituted the Well Baby Clinic and the Credit Union as part of the Church's ministry. The church continued to grow, enabling it to payoff the mortgage and add a basement annex for both spiritual and educational activities. Many community organizations used the facilities for meetings and special events. In 1960, Bishop W.C. Brown suggested the name of the church be changed from 15th Street Memorial to something new. A youth committee member, Clarence Weathers, suggested the name be changed to Hughlett Temple, because of the interest shown to all people by Rev. Hughlett. Bishop Brown accepted the suggestion, and the church became Hughlett Temple A.M.E. Zion Church. As the church membership continued to expand, the congregation, under the tenure of Rev. Simon Maker, projected the idea of building a new edifice on the Chestnut Street site. Rev. Maker retired in 1972 before this dream was realized, but the dream continued. The task of realizing the dream fell to the next two pastors, Reverends Harvest T. Wilkins and James F. Thornton. Adjoining properties were purchased and plans and funds for the project were progressing well. However, a minor setback occurred on February 27, 1979, when fire destroyed the sanctuary. Never the church to let adversity stand in the way of a goal, the membership, now meeting in the basement, agreed to continue with the planned expansion agenda. A few months following the fire, it was brought to the attention of the Church that the Fenner Memorial Lutheran Church at 2115 West Jefferson Street was for sale. Rev. Thornton and the building committee investigated and secured the purchase of the building with a full cash payment. Relocation Day, Sunday, October 26, 1980, dawned a clear, crisp autumn morning. Led by presiding prelate, the Rt. Rev, J. Clinton Hoggard and many visiting clergy, Rev. Thornton and the church family joyously walked or rode from the old Chestnut Street site to the new Jefferson Street site singing and praising God's name. Although not the new church building of the original dream, an even better solution had materialized to help the church realize its dream of a new sanctuary. Thanks be to God for the blessings he gives! Our next appointed pastors, the Reverends Earl R. Cheek, Lawrence R. White, Michael J. McNair, Dr. Lenton D. Rhodes, and present Pastor, Rev. Dr. Valerie Washington have continued the work of those who have gone on before them, adding their own special leadership skills. Many young men and women who received their religious and social training here have gone forth to start their own ministries and/or hold high ranks within the Kentucky Annual Conference or the A.M.E. Zion Church, to excel in the fields of education, healthcare and business, or to become good, hard-working contributors to our society. Hughlett Temple has withstood the test of time, ministering to all aspects of the church family and community. But most importantly, the Church continues to be a" House of Praise" by its ministers and members. It is our belief that "When praises go up, blessings come down". This has been proven over and over as we have overcome whatever befell us throughout the years. That's why Hughlett Temple is "146 Years and Still Praising His Name!"